Fuel-efficient, fun-to-drive and well equipped, Volkswagen offers the popular 2018 VW Golf in an extensive variety of 4-door hatchbacks. Models include two high-performance hot hatchbacks -- the legendary GTI and the 292-horsepower all-wheel-drive Golf R -- as well as the all-electric e-Golf. Prices start around $21,000 with a manual transmission. With its strong performance, impressive fuel economy, high safety ratings and class-leading fit and finish, the 2018 VW Golf offers an affordable, fun-to-drive package with European flair. The 220-horsepower GTI model is a favorite with enthusiasts all over the world. Volkswagen does not offer the 2018 Golf as a sedan. If you're looking for a traditional trunk, the automaker's popular Jetta model is the same size as the Golf with similar styling. The two also share engines, transmissions, suspensions and interiors. If the Golf's rear legroom is too tight for your needs, check out the more spacious Honda Civic. For 2018, Golf hatchback models are offered in Golf S and a new Golf SE trim level. Both get new, larger infotainment touch screens and refreshed front and rear styling that includes LED daytime running lights. All Volkswagens are now backed by a new 6-year/72,000-mile limited warranty, which is one of the longest in the industry. The Golf GTI gets a 10-horsepower increase to 220 horsepower. Visibility is excellent thanks to the VW Golf's large windows and thin pillars. Supportive and well-shaped, the driver's seat is height adjustable, and a tilt-and-telescopic steering wheel is standard. Getting comfortable in the Golf is not an issue. The overall interior design is upscale and maybe a bit understated with high-quality materials, soft-touch surfaces and, on higher trims, piano-black accents. The cabin has generous shoulder room in both rows. Cargo volume is 16.5 cubic feet below the parcel shelf and 22.8 cubic feet to the roof. The rear seat has a 60/40-split rear-folding back, expanding the load space to 52.7 cubic feet when lowered. One of the most recognizable and popular cars in the world, the 2018 VW Golf is also one of the most attractive cars in the compact class. Although its shape continues to offer a connection to the original Golf, which became a fashion icon over 40 years ago, the new VW Golf is highly tailored with crisp character lines, a steep hood and a narrow horizontal grille flanked by sharp headlight clusters. The car sits low to the ground and has a wide track, giving it a more muscular, purposeful appearance, and its distinctive C-pillar treatment visually pushes the hatchback down into the road. From behind the wheel the 2018 VW Golf is one of our favorite compacts, offering a desirable combination of comfort and performance. In all of its forms, the Golf is refined and quiet, but also responsive and sporty, with quick handling and powerful turbocharged engines that provide a satisfying jump off the line. The 170-horsepower Golf S and SE hatchbacks are peppy and handle better than most compacts. And the Golf's suspension works well with the hatchback's strong structure to smooth out rough roads. The 220-horsepower Golf GTI is an enthusiast favorite and the 292-horsepower Golf R thrills with all-wheel-drive traction and 0-60-mph acceleration in less than five seconds. Both offer a 6-speed manual transmission, but most buyers choose the excellent DSG dual-clutch automatic, which can be shifted manually via steering-wheel paddle shifters. The Manufacturer's Suggested Retail Price (MSRP) for VW's 2018 Golf S is around $22,000 including destination charges, which is competitive against comparably equipped Kia Forte, Ford Focus, Mazda3 and Subaru Impreza. The sporty GTI starts just over $27,000 and tops out around $37,000 for the DSG-equipped Autobahn. The Golf R starts around $40,500. The e-Golf begins right around $32,000 before incentives and is available in California, Connecticut, Maine, Maryland, Massachusetts, New Jersey, New York, Oregon, Rhode Island, Vermont and Washington, D.C. To make your best deal, check KBB's Fair Purchase Price, which shows what others paid for their Golf. Traditionally, Golfs tend to play on the weaker side of the residuals' field, although values for the GTI trims tend to be much higher. Among the 2018 Golf S trim's standard features are power windows and door locks, air conditioning, a 6.5-inch touch-screen infotainment system, Bluetooth, alloy wheels, cloth seating, steering-wheel controls, rearview camera and cruise control. The SE adds V-Tex Leatherette seating, heated front seats, push-button start, an 8-inch touch screen, blind-spot monitor, rear cross-traffic detection, Forward Collision Warning and autonomous braking. GTI SE models add the Fender Premium Audio System, rain-sensing wipers and leather seats. The Autobahn brings unique 18-inch alloy wheels, navigation and sport comfort seats with 12-way-power adjustment. In addition to blistering performance, the Golf R offers leather seats, automatic climate control, navigation and bi-xenon headlights. VW's DCC adaptive-damping system can tailor the car for Comfort, Normal or Race modes. A 6-speed Tiptronic automatic transmission is available on all 2018 VW Golf TSI models, while the GTI offers a 6-speed DSG automatic and the Golf R offers a new 7-speed DSG automatic. A Driver Assistance Package includes autonomous braking, adaptive cruise control and blind-spot monitor. On cars already equipped with these features, the package adds lane assist, front and rear park-distance control, park-steering assist and auto high beams. On the GTI, options include an adaptive-damping system and a performance package, which features larger brakes. Volkswagen is one of the few automakers to offer all-wheel drive in the compact class. VW's excellent 4Motion all-wheel-drive system is standard equipment on the Golf R. The system increases the Golf's traction on all road surfaces including the snowy and slushy. Sometimes lost in the Golf's extensive lineup is the impressive all-electric e-Golf, which offers all of the style, comfort and versatility of the Golf hatchback but with a zero-emissions powertrain. The fun-to-drive e-Golf is quick and agile with a range of 125 miles on a full charge. Powering up its depleted battery pack takes about six hours with a 240V-charging station. For 2018, VW Golf engines include a turbocharged gasoline 4-cylinder in 1.8-liter and 2.0-liter displacements. The TSI models use a 1.8-liter engine available with a 5-speed manual or 6-speed automatic transmission, while the GTI's 2.0-liter comes with a 6-speed manual transmission or, optionally, the 6-speed DSG automatic. The 292-horsepower 2.0-liter Golf R has all-wheel drive and a 6-speed manual along with an available 7-speed DSG automatic. Unleaded regular is recommended on the 1.8-liter TSI, while the 2.0-liter GTI and R require premium fuel. The e-Golf uses an electric motor and has an estimated range of 125 miles. It can recharge in about six hours on a 240-volt outlet and is compatible with DC fast-charging stations. Fuel-efficient, fun-to-drive and well equipped, Volkswagen offers the popular 2018 VW Golf in an extensive variety of 4-door hatchbacks and wagons. Hatchback models include two high-performance hot hatchbacks, the legendary GTI and the 292-horsepower all-wheel-drive Golf R, and the all-electric e-Golf. The as well as the Golf SportWagen and all-wheel-drive Alltrack wagon versions are reviewed separately. Hatchback prices start around $21,000 with a manual transmission and a 170-horsepower turbocharged 4-cylinder engine rated at an impressive 25 mpg in the city and 36 mpg out on the highway. Comfortable, sporty and stylish, the 2018 VW Golf is one of our favorites in the crowded compact class, which also includes the Honda Civic, Toyota Corolla, Chevy Cruze, Ford Focus, Mazda3 and Hyundai Elantra. 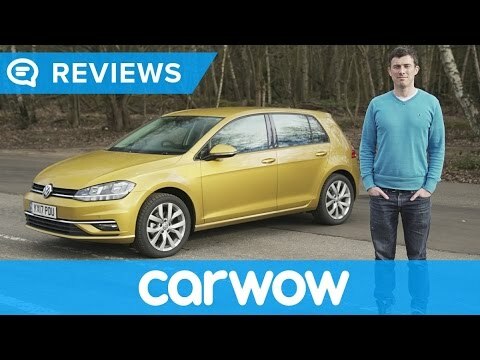 VW Golf Review--GOOD FIRST CAR? 2019 Volkswagen Golf review - Is it still the best all-rounder? | What Car? That is it is AWD for winter weather. I like that it is AWD, big enough for gear and dog and reliable.. I do not like that is automatic and a little slower than i'd like.. I love my Golf Alltrack! It has everything I could possibly need. Storage and style to go along with impeccable performance! Great gas mileage rides well. Looks good. Love manual transmission, easy handling, good visibility, safety..... Dislike lack of power seat adjustments..